Velcro rollers are oft-overlooked styling tools that create waves and curls that are soft and pretty, last a long time, and save your hair from damaging heat styling. You'll need a little extra time for creating Velcro roller curls, but the results are worth it. Velcro roller curls are great for a night out or a special occasion when you need your style to last. Depending on the size rollers you choose, you can get retro waves with big Marilyn Monroe volume or small, loopy ringlets. If you have fine, thin, or stubborn hair that just won't hold a curl, Velcro rollers can help create long-lasting volume. 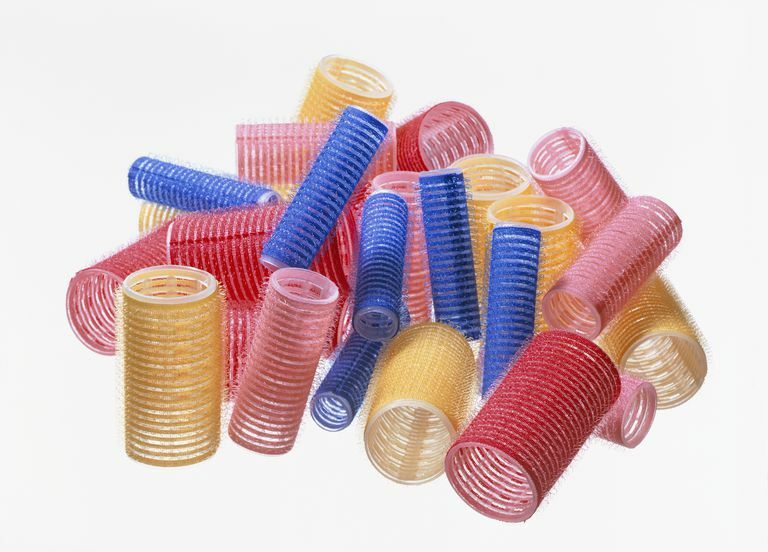 Velcro rollers: The size you need depends on the effect you want. Naturally, small rollers will give you small curls, and big rollers will give you waves or big volume, depending on your hair's thickness and texture. Conair's Self-Grip Rollers are an inexpensive option; they come in a multipack with rollers in assorted sizes, so you can experiment. Light holding or heat-setting hairspray: Choose a hairspray that's made for heat styling, such as CHI Infra Texture Hairspray. It provides texture and won’t weigh your hair down. Anti-frizz serum: Prep your towel-dried hair with a product that will keep frizz to a minimum. One to try: CHI Silk Infusion. Lightweight mousse: A volumizing formulation such as Kenra Extra Volume Mousse provides a firm hold without making your hair sticky or stiff. Add or subtract products depending on your hair type and texture, of course. You might have to play around with a few at first to find what works for you. The goal is to prevent frizz and provide a little hold without getting hard or sticky. Heavy gels and styling products can make your curls crunchy and stiff instead of soft and romantic. Also, too much sticky product can create the perfect storm for those rollers to get stuck in your hair. Start with freshly washed and conditioned hair. Towel it dry and apply an anti-frizz serum or hair oil and your lightweight volumizing mousse or spray. Here's the most important part: Allow your hair to air-dry (or you can blow it dry) until it is only about 90 percent dry—barely damp to the touch but not completely dry. It shouldn't look wet; the wetter your hair is when you put it into Velcro rollers, the longer it will take to complete your look, especially if you have long hair. If your ends get too dry, mist them lightly with water; just don't use too much. Then, spray your hair throughout with a light-holding, flexible hairspray. Comb through. Now you're ready to start rolling. Divide your hair into three large sections. Some people find that using clips to hold them in place is helpful. Choose a section and split it into a few more. The optimum number depends on your hair's thickness and length. They should be narrower than your roller and no thicker than the diameter of your roller. Comb each section thoroughly, making sure your ends are completely smooth. Place the roller near your scalp, at the bottom of the section. If you want your curls to be directed backward, place the roller behind your section. If you want your curls to be directed forward, place the roller in front of your section. If you want your curls to be directed under, place the roller under your section. If you want the curl to be directed up (to flip out), place the roller above your section. Use the roller to smooth the hair as you slide it through the mid-shaft to the ends of your hair. When you get to the ends, make sure they're smooth and in contact with the roller. Gently roll your hair onto the roller back to your scalp. Velcro rollers secure themselves—no pins or clips needed. Repeat for all sections of hair. Give your hair time to set. How long you should wait depends on the thickness of your hair and how wet it was when you started. Plan on at least an hour; the longer you wait, the better. For this reason, rolling your hair is ideal when you have somewhere to be at night and can spend the day doing other stuff around the house while your hair sets. If you don't have that kind of time, you can speed up the drying process with a hairdryer. Use a low airspeed only. Be sure that the air flows over your rollers in the same direction that your hair is rolled to prevent flyaways and frizz. Allow the rollers to cool completely after using a hairdryer. If you find that a section of hair is still damp, just roll it back up and wait for it to dry further. Focus on the rollers toward the bottom of your hair first, and work your way up to the top. Velcro rollers can get tangled in your hair, so use caution, and don't go too fast. Take your time so you don't cause frizz. Now that you've removed your Velcro rollers, you're free to discover your style. You can finger-comb and style your hair, or use a brush for even softer waves. Use hairspray to set your style as desired.